One of the top 3 questions we get asked is, “When is the best time to go bonefishing?” While the answer varies on the anglers’ expectations and their destination, here’s a good argument for fishing the winter months by Doug Schlink of Angler Adventures. For years I’ve heard that you shouldn’t go bonefishing in the winter months (December, January, February, even March) because of the risk of cold fronts. I’ve also heard and read that bonefish are temperature sensitive and it’s futile to fish in water temperatures under 70 degrees Fahrenheit. Hogwash! In 25 years of booking bonefish trips and making plenty of them myself, I’d like to offer my “observations” on the subject. While I haven’t adhered to strict scientific doctrine, I always carry a stream thermometer on bonefish trips and check water temps frequently. And in my opinion, it’s more important which direction the water temperature is moving. Yes, when a cold front pushes in and chills the water temps on the flats below 68 – 70 degrees, bonefish will start moving off the flats if they feel the temperature dropping, into deeper, warmer water. It’s generally accepted (and I agree) that smaller bonefish are more sensitive to cooler water temps and the bigger boys will stay up on the flats feeding longer with dropping water temps (and be the first to return on rising temps). I know a few trophy bone hunters who go in January so they won’t have to weed through the smaller fish! As the water temp continues to drop, the bigger fish will also move off into deeper, warmer water. But I’ve witnessed bigger fish feeding on the flat until temps hit 65 degrees. If the temp continues to drop or holds steady at less than 65, fishing will be slow. However, bonefish need to eat, and by design, they take their nourishment on the fertile, food-rich flats. 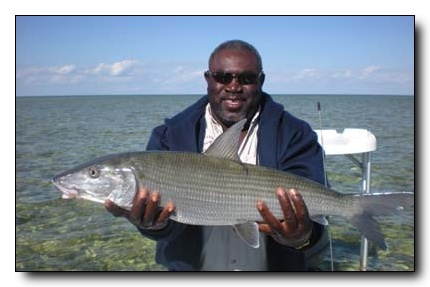 Deep water is Slim Pickens for a bonefish so they don’t like to stay there long. It’s been my observation, that even when air temperatures are in the low to mid-60’s, if the sun is out, the flats will soak up the sun’s radiant heat and warm quickly. As soon as the bones sense the water temperature is rising, they will return to the flats and feed voraciously. And the fishing can actually be fantastic. I’ve experienced this on numerous occasions, but perhaps the best example took place in late February on Grand Bahama a few years ago. Notice the Fleece? And the 14 lb January Bonefish? My fishing buddy, Mark Hatter and I arrived during a “cold front”. The water temperature on the flat was 63-64 degrees our first morning. But the sun was strong, and the flat was soaking in the radiant heat, and the water temp was rising. We barely got line stripped off our reels before we were making shots at hungry bones. The sun held and the water temperature continued to slowly rise (I checked it several times during the day), and the bones fed like gluttons all day! At 3:30 pm as we reeled in, I checked the temperature one last time – 69 degrees. We had boated 32 bones, all between 5 and 9 ½ pounds, and the water temp never even hit 70 degrees! It was a spectacular day of high quality bonefishing – in the dead of winter, on the tail of a cold front – when you’re not supposed to go! I’ve had other similar experiences that support my position. And on the flip side, I’ve lost fishing days to wind and sideways rain in April and May, so called “prime time”. The weather can bite you in the tail anytime. The guy who said, “the best time to go fishing is when you can get away”, may have known something the “experts” didn’t! So…Fear Not Winter Bonefishing! You might just hit some of the best bonefishing you’ve ever had! Want to learn more about bonefishing bonefishing in the winter months or go on a winter bonefishing trip – Call Doug in the Angler Adventures office (800-628-1447 / 860-434-9624) or email Doug@AnglerAdventures.com. Attention all bonefish anglers: We here at Angler Adventures are raffling off a free bonefishing trip for 2 anglers to one of the best destinations in the Bahamas, North Riding Point Club. This trip to Grand Bahama Island is valued at $6,600. 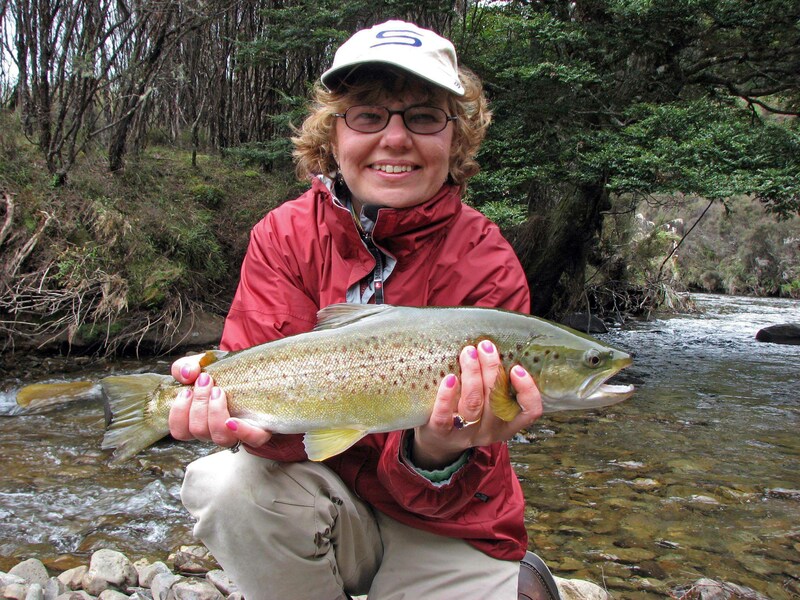 The trip is for 4-nights/3-days of fishing for 2 people anytime North Riding Point Club has space available during the months of January, February, March, June, July, October and December 2011 or 2012. It’s easy and free to enter – just email Evan@angleradventures.com for a chance to win this awesome bonefishing trip. Or, give us a call at 800-628-1447 (860-434-9624) and we’ll be happy to add you. Plus, to sweeten the pot, we’ve added a bonus promotion for everyone who enters the raffle. Stay 5-nights/4-days for the price of 4-nights/3-days. In other words, you pay $2,640 per person (October to the end of February and July), a savings of $660 per person or pay $3,300 per person (March through June), a savings of $900 per person.